I was part of a big rock in New Castle, Delaware, and the year was about 1770. It was a sunny day, and I heard his footsteps come closer and closer. He looked to be the 11 year old boy who was born October 4, 1759. I have a good memory for dates, because the big rock faces Matthias' house by the sea. I remember when his parents, Jacob and Rebecca, moved in. On the day Matthias was born, I remember hearing a lot of crying and excitement! I faced the little house, you see, and saw them all the time. Matthias cut my part of the rock with a sharp edge. He molded me into a circle with incised lines on the top, and with three holes around the center hole. I remember his smile. He was so excited he carved his name on my bottom, so that forever people would know who made me! Matthias took me to school every day. He wrote very well with the ink I contained, and even won an award for penmanship! My life was great, I really felt needed. 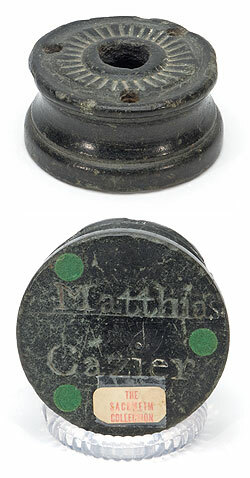 Then Matthias received a fancy inkwell from his father, and Matthias, who cherished me, picked me up and headed for the attic. I had company up there with all the old chairs and tables that were out of fashion that had been brought up there also. For years I lay there in the dark. The father came up to check to see if the chimney was safe a few times. He did not notice me in the dust. He bumped into me and I fell down between the walls! I'm not broken because all the dust and cobwebs from centuries cushioned the fall. There I lay for many, many years. Then one day - what was that loud noise? The wall was being torn down and a new family was moving in! I rolled out onto the floor. A man in old work clothes picked me up and put me in his pocket. I was sold for a small amount of money to a man who admired me. He said I was an antique, whatever that is. At least I felt treasured again, even though my usefulness had slipped away. I was eventually sold to a man named Jerome Sackheim who lived in California, and he kept me with his collection of antiques for a long time. Then I was sold at an auction when he died. Now I'm in the collection of a lady who has lots of old things from my time. She belongs to a group called "The Society of Inkwell Collectors", where everyone is interested in old inkwells. I'm back in my glory again! People come in the home and pick me up and say, "Wow! This is a really neat inkwell! Matthias Cazier, what a wonderful old name!" My picture is even in their magazine, The Stained Finger! I hope I will be part of her collection for a long time! Writer's Note: I have done the genealogy for Matthias. The date of Matthias' birth is correct, and he did live in New Castle, Delaware with his parents, Jacob and Rebecca. Matthias married Lydia Crane in 1789 in Essex, New Jersey. He died the 17th of May in 1837. They had no children. Jerome Sackheim did own the inkwell for a time. It was sold at auction... and finally I bought it from a dealer.